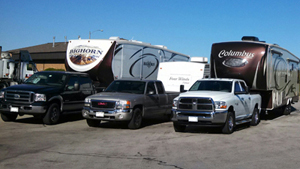 The Illinois RV Camping Club originated through Starcraft RV made up of Starcraft RV owners. Although we are no longer sponsored by Starcraft RV, we continue to provide opportunities for members to enjoy good fellowship and pleasant use of their camping vehicles no matter what brand RV is owned. We have a president, secretary/treasurer, and three vice-presidents who secure campsites and organize weekend activities. We meet once a month from April to October, usually the third full weekend (Friday, Saturday, Sunday) of the month. The April and October campouts are usually in the southern third of the state, May and September are usually in the central third of the state, and June and August are usually in the northern third of the state. July is usually reserved for the Starcraft International Rally held throughout the United States or Canada. While camping we generally have community breakfast and dinner Saturdays. Sundays we enjoy a community breakfast. A brief meeting is usually held Saturday, along with free time to explore the area, play cards, swim or whatever you desire to do. 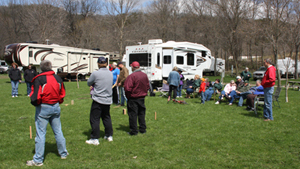 Trailer – bingo – is generally played before dinner Saturdays. Of course, bonfires each evening, weather permitting. January or February we host a 'Camp-Inn' at a hotel to have a chance to visit during the long winter break. We try to get a hospitality suite for gathering and a pool to relax in. Annual dues is $20 if paid by the end of the previous year, $22 after January 1 of the current year. Dues help cover costs of supplies for the weekend activities - coffee, firewood, part of the meal, monthly newsletter and various mailings. Usually each camper provides a dish to pass for community meals. 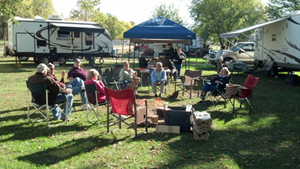 New members are invited to join Illinois RV Camping Club as our guest for the first year free.